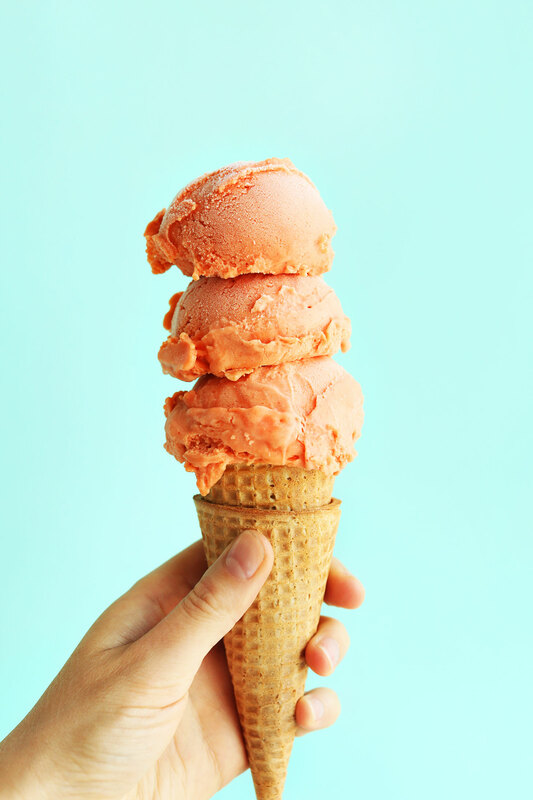 When I was a kid, I was a sucker for a good orange sherbet. In fact, orange push-up pops (anyone remember those?!) were one of my favorite summertime treats. When given the option, I’ll almost always choose ice cream over sherbet and sorbet because I much prefer richer, more indulgent flavors (like Sea Salt Caramel). But my dairy intolerance has pushed me to develop more of a palette for fruity flavors, which often come in the form of sorbet. I’m slowly but surely getting on board. 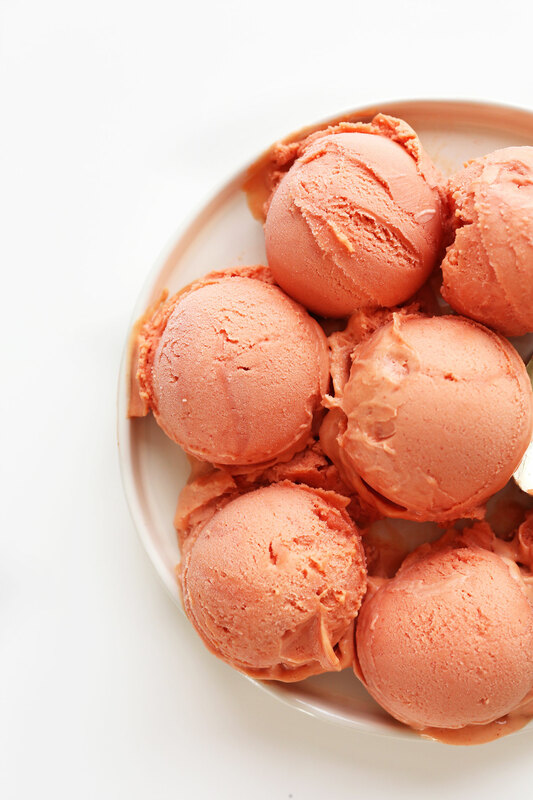 This recipe was my first attempt at homemade sorbet and I’m floored with the results. If you make one dessert from our blog this summer, make it this one! Mango is so naturally sweet and creamy I suspected it would lend itself perfectly to sorbet. Thankfully, that’s exactly what happened. This recipe is a sorbet-sherbet hybrid, with the addition of coconut milk for an extra-creamy touch. And the flavor? So tropical and perfect I could hardly stand it. I found that the combination of mango + raspberry + coconut somehow = GUAVA, so much so that I almost called it guava sorbet! But, that would be misleading, I suppose, since there’s no actual guava in the mix. So, Raspberry Coconut Mango Sorbet it is. This recipe is simple, requiring simple methods and just 6 ingredients. It does require an ice cream churner, but the base is so thick and creamy that I think you could get away with just freezing the base and stirring/whisking every hour to achieve a light texture. 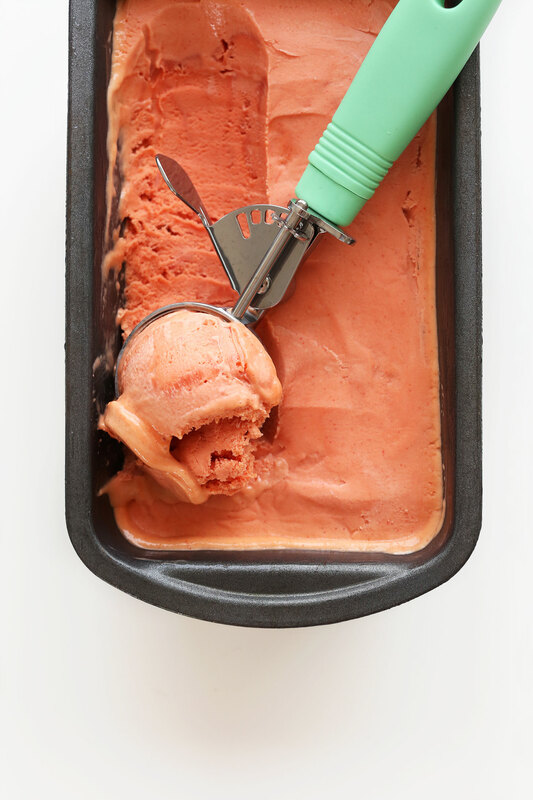 Not everyone will be on board with using straight up cane sugar (I was hesitant myself) as this recipe requires, but that’s kind of the science of sorbet. You need it to create the right texture and sweetness without introducing unwanted flavors (like maple syrup would). I did a lot of research on the sorbet (primarily over at Serious Eats – a fantastic site for new and curious cooks) prior to this recipe. And as far as I understand it, the two best sweeteners for sorbet (and sherbet) are: 1. Corn Syrup (not high fructose), and 2. Sugar (granulated or cane). I was a little weary to try corn syrup since it’s not a common ingredient, nor does it have the best reputation. (Try asking a Whole Foods employee if they have corn syrup and see how many appalled looks you get.) So I went with cane sugar and must say the results were phenomenal. Obviously, cane sugar is more “processed” that maple syrup or coconut sugar, but I would highly recommend sticking to the recipe as written. The only alternative sweetener I would suggest would be substituting honey for up to half of the sugar, since it’s minimally processed, floral, and has a natural thick/creamy texture. However, that would make this recipe not vegan-friendly, so test and substitute as your dietary needs and preferences allow. If you make this recipe – and you absolutely must – let us know! Leave a comment and rate it below. And while you’re at it, take a picture and tag it #minimalistbaker so we can see your creamy, dreamy creations. We love seeing our recipes come to life in your kitchens. Cheers! 6 ingredient Mango Sorbet with creamy coconut milk and a handful of fresh raspberries. Creamy, tropical (like guava! ), perfectly sweet, and delicious for summertime. The night/day before churning, set your ice cream churning bowl* in the freezer to chill. 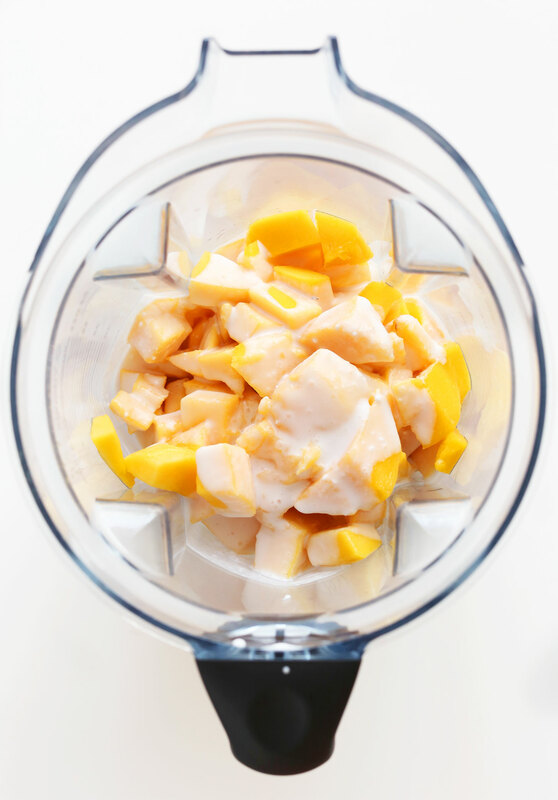 Also add all ingredients to a blender and blend on high until creamy and smooth - 2-3 minutes. Taste and adjust flavor/sweetness as needed, then transfer to a mixing bowl and cover. Set in refrigerator to chill overnight (or for a minimum of 3-4 hours). The following day, add your chilled base to the prepared ice cream churning bowl and churn according to manufacturer’s instructions for 30-40 minutes, or until it looks like soft serve. Transfer to a freezer-safe container and smooth top with a spoon. Cover securely and freeze for 4-6 hours, or until firm. Let thaw at room temperature for 10-15 minutes before serving to soften. Use a hot scoop to ease serving. Will keep securely covered in the freezer for 7-10 days, though best when fresh. *This recipe as tested does require an ice cream churner, but the base is so thick and creamy that I think you can get away with just freezing the base (not churned) and then stirring/whisking every hour to incorporate air until firm. *You can sub light coconut milk but with less creamy results. *I do not recommend trying to substitute maple syrup, coconut sugar, or agave for the cane sugar in this recipe. It will affect the flavor and texture negatively. Cane sugar or even corn syrup (not high fructose) are best. The only potential alternative I would recommend would be subbing up to half the amount of sugar with corn syrup or honey (which would make this recipe not vegan-friendly). *Methods adapted from Serious Eats. Hello! Have you tried using monkfruit instead of cane sugar? I’m curious. Any thoughts or concerns using it instead of cane? Hi Helen, we would think that would significantly impact the texture, but it might work! If you give it a try, we would love to hear how it goes! This is my second time making this the first time was the mango/raspberry and it was awesome. This time I made it with fres peaches and strawberries cut the sugar in half and added a tablespoon of peach vodka to keep it from freezing too hard. Just had to let you know how much I enjoyed it….thank you for the recipe. Thanks for sharing, Sherie! We are glad you enjoyed it! I am unable to purchase ice cream or sorbet in the market because they are full of sugar and I don’t do artificial sweeteners. I came across your recipe on Yummley and decided to give it a try. Best choice picking out yours out of the countless ones on the Internet. It was totally awesome. I did have to omit the sugar but it was plenty sweet naturally. Thank you for sharing. This recipe was totally awesome, Creamy, and o so good. Yay! Thanks for sharing, Deb! Totally want to make this, but don’t have an ice cream maker etc. Can I use my vitamix and blend all the ingredients and freeze in a loaf pan? Hi Chrissy! I believe we’ve given tips for if you don’t have a churner in the notes. But if you’re interested in a churner, find the one we use here! How would using no sugar at all go? Or at the very least only using 1/2 cup? Is it necessary for the texture? I’m a fan of un-sweetened fruity desserts as the natural sugar in the fruits is plenty enough for me so I would love to try it with this delicious combination. OMG this is wonderful! Great taste not too sweet very refreshing. Will be making this a lot. Make sure your fruit is super-ripe – even too ripe for eating straight. You can decrease the added sugar a bit that way, and still get intense fruit flavor. This recipe is just perfect. What’s with all these people saying the recipe looks good? Only people who have tried the recipe should comment. I tried this recipe. It is only so-so. I made the recipe as described, although I added more lime juice to give it some umph. The color was very orange, not guava-ish. The flavor was so-so. I passed the pureed mixture through a strainer. The recipe makes no mention of this, but otherwise, you will end up with a very seedy texture. The recipe needs something else–an herb or a liquor. As it is, it’s pablum. Looks so delicious! Any tips for a way to make this without sugar or less? I made this and all our guests LOVED IT. It was so so creamy and perfectly sweet. For sure going to make this again! I tried to do two different of your vegan ice cream recipes and both of them turned out way too hard and solid to eat :( I have a proper ice cream maker, and the bowl is always straight out of the freezer before churning. I have never made vegan ice cream that came out right. Please help! I can’t keep spending $5 on B&J’s every time; it’ll drain my bank account haha! Oh Dana, your beautiful recipe makes me long for summer even more! It looks gorgeous and sounds delicious! I have always adored eating mangoes and raspberries and anything with coconut in it thus I couldn’t wait to make this sorbet. The flavor and color are luscious! And so easy to make, even without an ice cream maker. Thank you for this amazing recipe Dana! Hello! I’m curious about part of your recipe. I happen to be allergic to coconut in all it’s delicious(but sadly lethal) forms. Is there a substitute in your recipe that you would recommend in place of the coconut milk? If there is, then I’d love to try this recipe. Hmm, how about homemade creamy (as thick as possible) almond milk instead? Thanks! I’ll give it a go with that, then, and let you know how it goes. love this recipe (have now made it several times). I have a case of peaches coming my way. Do you have a good non-dairy peach sorbet recipe? Could I use stevia…I have a niece who can’t have regular sugar. I’m not sure, I think it’s pretty key. But if you try it let me know! How could i adapt this amasing recipe to make popsicle? Thank you? I would make it up until churning and instead just pour it into popsicle molds! Made another batch of this yummy delicious goodness, and as I noted above, I did strain the raspberry seeds through a sieve, and it is much, much better this way. I also used only 2 TBS of sugar, which was plenty for my tastes. I found organic raspberries on sale at my local market and picked up quite a few pints to freeze so I can make this again in the future! I made this dreamy dessert over the weekend, I have to say true to Dana’s amazing ability in the kitchen, I really enjoyed it. However, I’d like to offer a few modifications. I started out by using only 1/2 cup of organic cane sugar. It’s a good thing I did because I feel that I could easily have started out using 1/4 cup and adding more to taste. Maybe my mango was sweet, I dunno, but this batch was a tad too sweet for my tastes. I was thinking about the possibility of adding a bit of tequila to the recipe. I think that it would fit the flavor profile well, and would keep the sorbet a bit less frozen. If I was to go down this road, what amount of tequila would you recommend? I’m thinking 3 Tbs …. thoughts? OMG!!!! I rate this 10 out of 10! However one clarification….I did not use mangos, I used peaches instead (my preference). It was absolutely AMAZING. DEFINITELY A KEEPER!!!! I am now going to try your cookbook. THANK YOU VERY MUCH!!!! I think frozen would work! However, take into consideration that freezing usually adds extra moisture. Maybe let them thaw and dry them to be safe! I left out the sugar all together and it was amazing the fruit definitely is sweet enough. Nice little pick me up for me during my university exams. I made this yesterday as dessert to a spicy Asian stir-fry. Preparation was super-easy; I squished the raspberries through a strainer to get rid of their tiny pits before blending it all together and used only about 3/4 cup of sugar. Since no one I know has an ice cream maker I just put it in the freezer and stirred it every hour. However, even after almost 10h it still wasn’t completely frozen, so we ended up eating it as some sort of soft serve. The flavor was incredible! Watching my friends trying to guess the ingredients was great fun, too. ;-) This will definitely go into my recipe collection! Made this today and oh.my.gosh. is it amazingly delicious!!! My kids loved it! We will definitely be making this again! Thank you so much!! Yummy! I’m making this with my girls tomorrow for Mother’s Day! Can’t wait to try it! It looks so delicious! It is perfect for the summer days. I am so obsessed with your blog! All your recipes are so creative and delicious while keeping them healthy at the same time. Thanks for sharing. I made this recipe to end an Asian- themed dinner. It turned out perfectly and was very well received. It probably wasn’t all that Asian but I always like sherbet/ sorbet with my fortune cookies. Please tell me if the coconut milk used in this recipe is canned or could the refrigerated coconut milk (found in dairyvsrction near almond milk) work? Thank you. I wouldn’t recommend refrigerated coconut milk – it isn’t creamy enough. Canned is best! Made this and had to resist the urge to eat it before it was done. Absolutely delicious! wonderful! Thanks for sharing, Nikki! Have taken to doubling the recipe. We serve with raspberry syrup and fruit salad…. UNBELEIVABLY perfect. Thank you! Forgot the raspberries once and still a big hit! Made this for the weekend and loved it. So simple and you’re right…..it did have a guava taste! I served mine with a couple raspberries on top and it was a hit! Thanks Dana. So great! Glad everyone enjoyed it, Sue! In love with this recipe! Am interested in trying it…would it be okay to try frozen fruit instead of fresh and thawing them then blending? I think that would work! I love how you mention Serious Eats! I was also on that websites just looking around and then somehow I ended up on your website and its truly amazing as well!! Love the vegan specialty on here!!! I’m starting vegan and always looking for new ways to make food.Thanks for a wonderful website! Yay! Glad you liked it, Paige! thanks for sharing. Hi Dana, I’ve been trying to make ice cream at home but every time it comes out it doesn’t really hold together so when I try to scoop it out the scoop falls apart. any ideas? :( I used different recipes (my own) and I can’t figure out what’s wrong. I’ll have to try! I think it’s because I was using frozen fruit and putting a smoothie-like mixture into ice cream maker so it was done too fast and didn’t churn enough. not sure. I did luck out with a chocolate one this weekend :) thank you! I made this with little blackberries from my yard, plus a little extra lime as the berries were very sweet…And holy coconuts, it was to die for!! And a gorgeous violet hue! Thanks for the recipe! Wow, just wow…what beautiful photos, and amazing recipe. Love it all! Think this would work to make ice pops? I just bought some molds and think this flavor pairing would be great to break them in! Lucky girl! Hope you love it! Is that a gorgeous colour or what!? I am usually more of a fan as creamy ice creams but you might be turning me into a sorbet convert!! I remember those Push Pops! My sister and I would head down to the store on hot days with our allowance and buy these pops. They did not cut up the sides of our mouths like Freezies did and we loved the flavours. It was worth eating them, even though occasionally get chased by a sweet treat seeking bee or two on our way home. 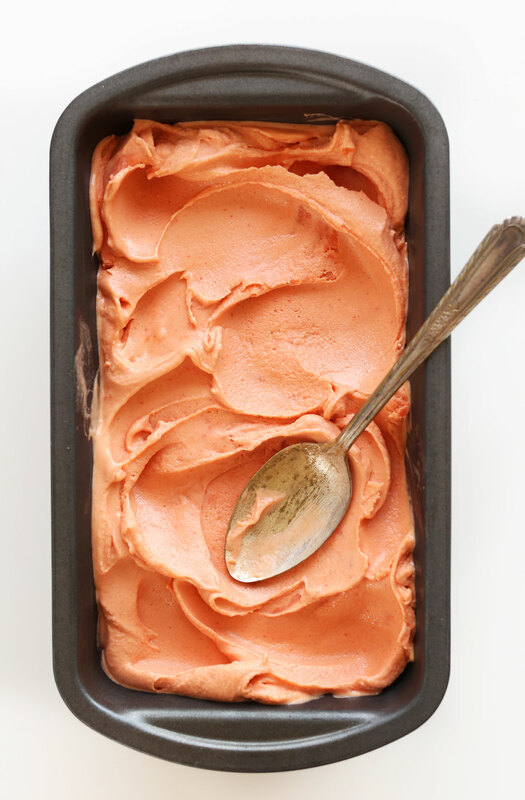 If you’re like me and don’t think you like sorbet, you should try this recipe anyway. I made it exactly per the recipe except for that I used frozen mango. It’s ridiculously simple, the results are amazing and it’s perfect for a sweltering evening. Thanks for another great recipe, Dana. Ah, thanks Heather! Agreed! This recipe is one of my absolute favorites to date, and I’m not even that big of a sorbet fan either! Thanks for the kind words, Heather! I’m going to repeat what everyone else has mentioned and say, that color! Stunning. Although, I don’t have an ice cream maker, I want to get one just so I can make this recipe. This looks & sounds delicious! I love the colour, and the raspberry mango pairing sounds delicious! I actually just posed a sorbet recipe on Tuesday on my blog too, but it’s cherry flavour and requires no ice cream maker. Oh nice! i’ll have to check it out! I’m halfway through it, blended everything smoothly and it is chilling over night. My kids are on a strict no dairy, no gluten, no nuts diet and this recipe is perfect for them. They love sorbet, and I’m so glad they can have coco. Can’t wait to try it tomorrow night. Yay! Let me know how it went! It is officially a winner! My parents are visiting, and everyone loved it, young and old. It was the first time ever I used my ice churner, and won’t certainly be the last. All I can say is, bring on the sorbet recipes ! I’m definitely making this one again. I might just slightly reduce the sugar content to 3/4 of a cup, depending on the fruits’ sweetness. Thanks again for a delicious treat. Oh my goodness! This looks so delicious and the color is so, so pretty! I have been looking for an excuse to pull out my ice cream churned, and I think this is just about perfect! Thank you so much for sharing this recipe! DO IT. This is the perfect recipe for your ice cream maker! It makes it so soft and creamy! It is supposed to be a hot week here, so the timing is perfect!! The color is great! And flavor sounds very nice. So beautiful! I just started a personal blog and wrote my first post about breakfast at home, still so much for me to learn about blogging :) your photos are so colorful and inspiring! Ah, thanks Nobel! Blogging/photography is a slowly evolving art, so stick with it! This looks awesome. I am not vegan, but I started following you because I am gluten free. I also cook for special diets. Enough said, you are my new favorite. I have tried recipes for my family, vegan, gluten free, and I have not had one complaint. Win win. Keep keeping doing what you do. Soooooo creamy and pink! I could eat two or even three cones! So good! Made this tonight after seeing this recipe right before heading to the grocery store. I used frozen mango and raspberries so I didn’t need to chill it before churning and it was perfect! I’m more of an ice cream/gelato person but I will definitely make this sorbet again! You’re quick! Glad you enjoyed it, Taylor. Thanks for sharing!! Dreamy. That’s the first, or, okay, second after the obvious ‘creamy’, adjective that came into my head looking at this. Mango is my favourite fruity ice cream flavour [and measure to rate ice cream parlors ;)] so merging it with coconut and raspberries is amazing. This totally makes me want to finally look for my ice cream maker in the attic. Not exactly my favourite part of the house but what doesn’t one do for ice cream?! I don’t like mango and it’s too cold here for ice cream and yet, I still want to jump through the computer and have a scoop or two of this ice cream. Oh this looks soooo delicious and the colours are just beautiful. I never tried sorbet so far, but I guess after seeing your yummy creation, I might wanna try it. That color though – agreed! Hope you give this one a try! Please do! Hope you love it! Why not use agave to sweeten? Would that solidify too much in the freezer? Dana, you are going to be single-handedly responsible for me breaking down and purchasing an ice cream churner. Hi Meredith! I believe I gave tips for if you don’t have a churner in the notes. But if you’re interested in a churner, find mine here! 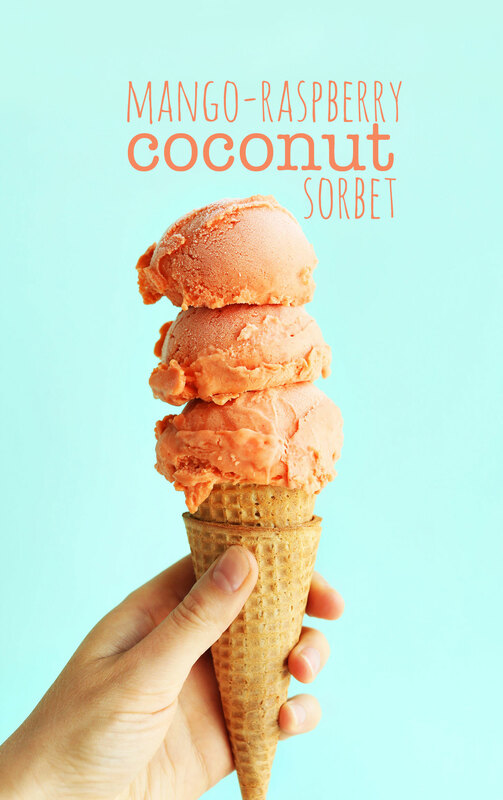 This sorbet looks incredible, Dana, and your photos are PERFECT. I’m usually more of an ice cream person, too, but gosh… I love the flavors in this. Mango + Coconut + Raspberry sounds like an amazing combination. I feel like I could dive into my screen and take a bath in this sorbet… it looks so creamy and dreamy! Love! Pinned!